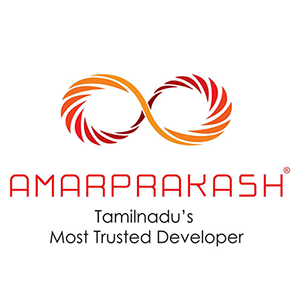 Incorporated as Amarprakash developers in 2004 to undertake residential construction in the city, we have changed our portfolio to a private limited company known as Amarprakash Developers Private Limited in the year 2007. Ever since our inception 10 years ago as promoters in Chennai, we have made a noteworthy presence in both conservative and modern dimensions of real estate development. With our massive infrastructure and innovative design, today our building company has become one of the most dignified and foremost names in the Chennai real estate industry. The reputation we have achieved in the realty field is because of our clear vision and systematic approach towards materialization. We, Amarprakash real estate promoters truly believe that our homes will last for generations because our experts have been consistently delivering innovative and quality buildings with updated technology. We provide the best of services with the support of more than 750 dedicated professionals whose skills are at the pinnacle of the construction industry. We have had a good track record of over 12 years in the construction field which helped us reach a trustworthy position in the real estate market. Having established a good record in the field of construction, it has helped us gain a reputed name in the Chennai construction industry. We have successfully served more than 3400 happy customers and handed over eight residential projects with the development of more than 2 million Sq.ft and another 8 million Sq.ft of residential and commercial development under construction.